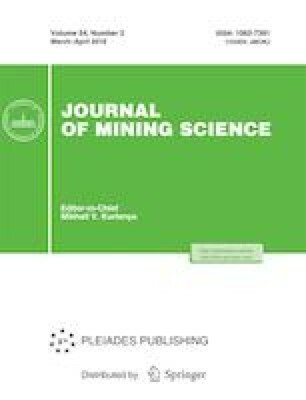 A new mechanism of rock deformation around underground mine workings is presented. The method is developed for calculating geomechanical state of rock mass; this method takes into account rock weight, the action of which coincides with the directions of tensile stresses on the mine working contour, while these directions differ in the floor. The proposed calculation method for rock deformation includes two additional parameters characterizing the ratio of mine working roof displacements to the floor displacements and the ratio of day surface displacements to roof displacements which are determined experimentally. Original Russian Text © M.V. Kurlenya, V.E. Mirenkov, 2018, published in Fiziko-Tekhnicheskie Problemy Razrabotki Poleznykh Iskopaemykh, 2018, No. 2, pp. 3–9.